Celebrating the Mandolin in Asheville NC, Celtic Style! Here’s a great tune I learned from John Doyle. This is the tune of the week! See the video below to play along! Two nights ago, at the White Horse in Black Mountain, NC, we played these two tunes together. The Old Bush and The Maple Leaf. For you guitar flatpickers, here are those same tunes tabbed out in standard tuning and DADGAD. While I’ve always found the “chopped off head” youtube videos kind of strange, this is the best one I could find at the time for The Maple Leaf. New tabs, tablature, standard notation and chords have been added to the tunes section, both for mandolin and guitar. As promised, I finally got to tabbing out Peter Byrne’s Fancy and Creeping Docken. There was also a request for Cup of Tea. That one’s for you Michel in France! Joe Cooley’s was just for fun. It goes well before Cup of Tea in a set. In the Mandolin II class at Celtic week, with David Surette, we learned a few tunes by ear, a few by tab, and also focused on how to make accompaniment with the mandolin interesting. I had to leave “the gathering” earlier today, to visit the in-laws, and so have had some time in the car to tab a few of the tunes for you. Click on the links below for the mandolin tablature for the irish tunes of (reel) Devanney’s Goat, (reel) Poor Old Woman, and (slip jig) Hardiman the fiddler. 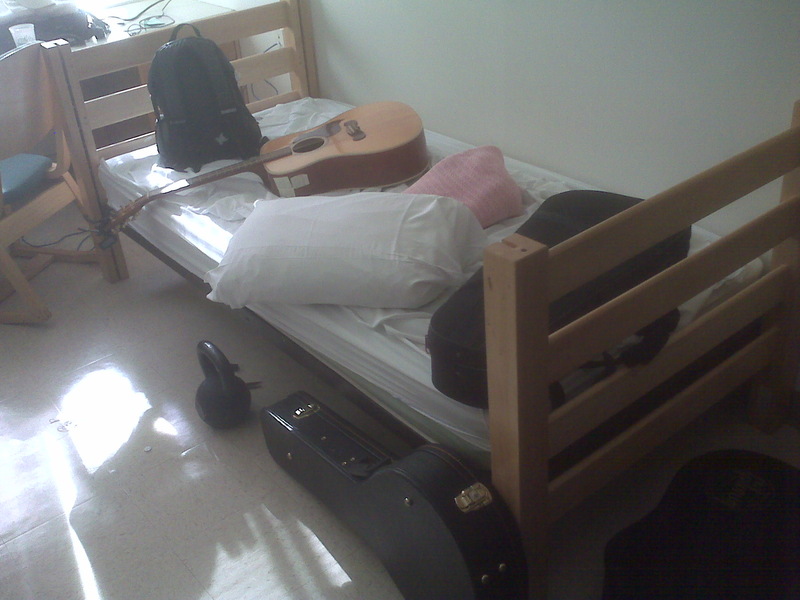 Dorm Room at Celtic Week 2011 - Guitar, Mandolins and Kettlebells, what else do you need? We also learned a great tune called The Reverend Brother’s Jig (called the Monk’s Jig on thesession.org) and a number of Breton Tunes. Great class, good teacher, learned a lot. Today I was inspired to tab out one of my recent favorite tunes. One is called The Choice Wife, or O’Farrel’s Welcome To Limerick. The mandolin tablature also has standard notation. You can access these files as .pdf clicking the links below or through the tunes page. This is a tune played often at the Jack of the Wood session, when Sean is on the pipes. It’s got a great groove, and nice melody. there are a number of them which are not. 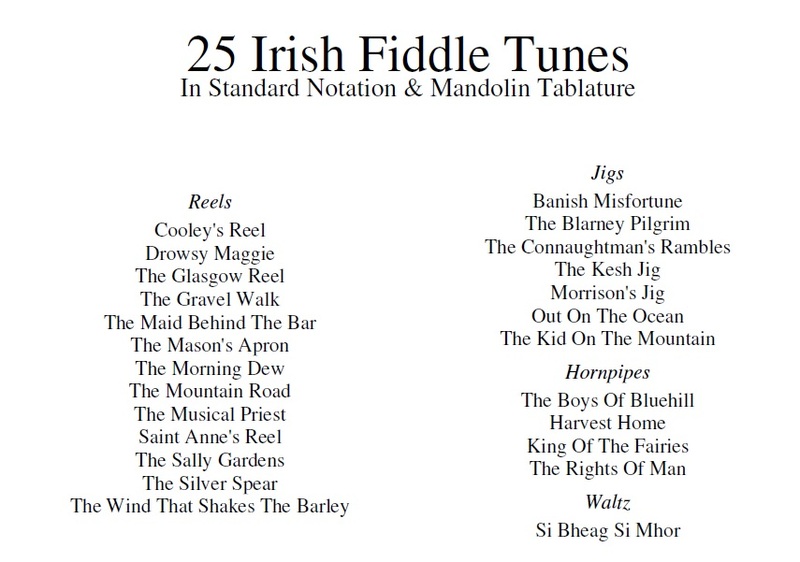 Enjoy adding these common irish session tunes to your repertoire. I look forward to seeing you at the Jack of the Wood some time here in Asheville! Click the Link above to view or Download this file. See below for a great book full of Mandolin tab, standard notation and chords for the Celtic/Irish mandolin, octave mandolin or tenor banjo player. 20% of all profits go towards the Swannanoa Gathering Scholarship Fund. A few days ago I attempted to record The Merry Blacksmith with Tam Lin on my octave mandolin for a student. I didn’t feel it turned out very well. Even though I used a click track, somehow the tempos on Audacity got mixed up, and it sounded really shoddy. Letting some frustration pass, I then decided to try one of my favorites (that no one seems to play for some reason) The Solstice, with the Merry Blacksmith. I’m happy with the results. Sharing mandolin and flat picking guitar (tabs) tablature and standard notation from the celtic tradition.